Homeowners should not approach Asian hornets' nests on their property, authorities have warned, after a woman nearly died from the aggressive insects' stings when she got too close to one. 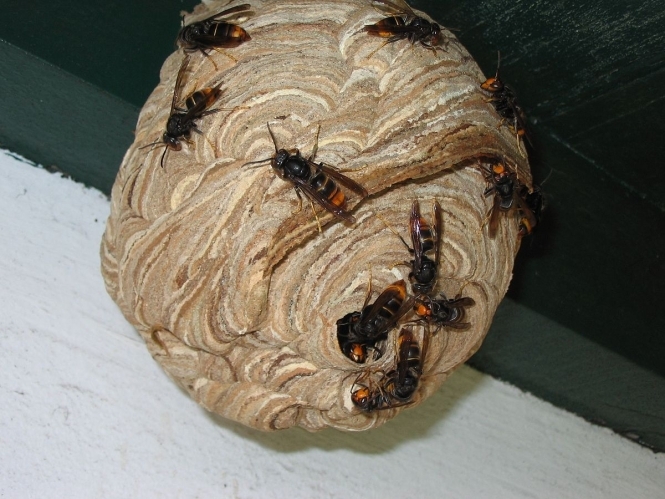 The woman, from Beauvais in the Oise, went into anaphylactic shock after she was stung at least a dozen times when she disturbed hornets that had built a nest in an outbuilding in her garden, leaving her dizzy and with rapidly failing eyesight, France 3 reports. She managed to call emergency services before she blacked out, which saved her life, her doctor said. Her blood pressure had dropped to dangerously low levels by the time firefighters arrived. She was treated at the scene before being taken to intensive care at hospital. She would have died within five minutes without treatment. Fully recovered, she has returned home, but refuses to approach the outbuilding in her garden where she was attacked more than two weeks ago. Asian hornet venom is neurotoxic, and the fact that the animals are aggressive and that victims often suffer more than one sting makes them especially dangerous. In most cases they nest high up, but homeowners are warned not to try to dislodge the nests by themselves and instead notify firefighters, local authorities or private operators who are specially trained and equipped to deal with the nests. Firefighters will, where possible, set up a 50m perimeter when dealing with a hornets' nest. Asian hornets have across half of France since arriving in a shipment of pottery more than a decade ago.